As his side has sought to chase down Championship leaders Rangers, Hibs boss Alan Stubbs has steadfastly insisted there will be plenty of twists and turns before the title’s destination is finally settled. However, it’s probably fair to say he never anticipated things to twist one way only to turn back in the opposite direction within the space of a few hours. Eight points adrift of the Ibrox club, but with a game in hand and Mark Warburton’s side yet to pay a second visit to Easter Road where they lost earlier in the season, Saturday past appeared to be a pivotal day in their league campaign. Buoyed by the news which had filtered through from the Indodrill Stadium that basement outfit Alloa Athletic had held Rangers to a 1-1 draw, Stubbs’ players took to the pitch at the Tony Macaroni Arena knowing a third victory of the season over Livingston would see them trim the Glasgow club’s advantage. Unfortunately, though, a team which had previously suffered just one defeat in 25 matches as it fought on three fronts – a League Cup final berth already booked and hopes high their Scottish Cup run will continue beyond tomorrow night’s replay against Capital rivals Hearts – chose to turn in arguably their most disappointing performance of the season. Credit, of course, is due to Livingston for that being the case, David Hopkin’s side, as Stubbs himself admitted afterwards, fully deserving of the point this no-scoring draw brought them. It was, though, a point which was more welcome to Livingston than it was Hibs, the gap between themselves and Rangers remaining at eight points, although head coach Stubbs and his players will undoubtedly argue there will be more twists and turns to come. That may well be true, but as everyone knows, we are now at that stage of the season where games – Hibs have 13 and Rangers 12 to play – suddenly begin to disappear, whether you are chasing a title or battling to avoid the drop. However, while conceding it was a chance missed, head coach Stubbs couldn’t find it within himself to lay into his players given the way they have responded to switching between the League Cup, Championship and Scottish Cup in recent weeks, an unrelenting run of matches which has tested them both physically and mentally, not least that epic fightback at Tynecastle. And his insistence that a line would be drawn through this match and the focus immediately turn to tomorrow night’s replay before a 20,000 crowd at Easter Road was reinforced by the revelation his players reported to their East Mains training base yesterday to begin those preparations. “Frustrating,” mused Stubbs, “I think that’s the word for it to be honest. I don’t think we deserved any more out of the game than we got. “We just did not do enough to warrant the three points and I thought Livingston fully deserved their point. We were not 100 per cent on it, but results like this can happen. It happened earlier on [in the day at Alloa]. There are no easy games in this league. Stubbs’ determination to take the three points was evident, Anthony Stokes operating at the head of the midfield diamond behind the front pairing of Jason Cummings and Chris Dagnall, adopting the mantle of playmaker but, unfortunately for Hibs it was a move which didn’t quite come off – a bit like the rest of their play. Much of that, though, was down to the organisation of Hopkin’s team, Livingston determined not to throw caution to the wind. Even when they were in ascendancy in spells the back four didn’t break ranks, sitting deep eo ensure there was no chance of being hit on the counter attack and when Hibs were in possession, centre backs Daaren Cole and Ben Gordon marshalled their team-mates superbly to deny the opposition a clear sight of goal. 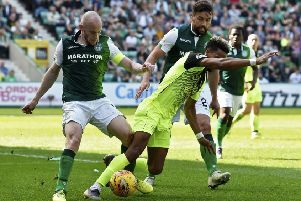 Hibs did have a few half-chances but little more, although skipper David Gray did see one late header taken off the line by Gordon. For their part, Livingston would point to forcing Paul Hanlon to nod Scott Pittman’s effort from under his own bar in the opening minute, goalkeeper Mark Oxley’s brave block after he’d punched a cross to the feet of Gary Glen and a Jordan White shot which crashed back off the bar. The fact they didn’t test Livingston goalkeeper Marc McCallum nearly enough would certainly have been a source of frustration and disappointment for a team which ended the day having failed to score for only the second time this season, although the argument remains that for all they boast an array of strike options which would be the envy of many of their opponents, Hibs don’t get as many goals as one might expect. As midfielder John McGinn suggested, given the quality within Stubbs’ squad, Hibs should be able to cope with days when performance levels dip, the Scotland Under-21 captain saying: “It was disappointing, frustrating – all the words you can find. Like Stubbs, McGinn refused to use a punishing schedule as an excuse, denying he and his team-mates might be jaded. He said: “We have a big squad, quality players on the pitch and on the bench who can come on and have an impact.